Quarterback Robert Griffin III became the first player from Baylor University to win the Heisman Trophy, college football’s top individual honor. Griffin received 1.687 points, beating by 280 points Stanford quarter Andrew Luck, who finished as runner-up to 2010 winner Cam Newton. University of Alabama running back Trent Richardson was third with 978 points. The balloting was conducted by the Heisman Trophy Trust and the winner announced tonight at a televised ceremony in New York. “This moment right here is unbelievably believable” – said Griffin, who had earlier shown off his blue Superman socks that had red capes draping off the cuffs. Griffin, a 21-year-old junior at the Waco, Texas-based university, finished the season as the nation’s top-rated quarterback, completing 72.3 percent of his passes for 3,998 yards and 36 touchdowns, with six interceptions. He also rushed for 832 yards and nine scores as Baylor went 9-3 – its best season in 25 years – and had a winning record against Big 12 Conference opponents for the first time. Griffin, nicknamed RG3, is the third Heisman winner in 14 years to play for a team that lost more than two regular-season games, joining Tim Tebow of Florida in 2007 and Ricky Williams of Texas in 1998. Baylor is 12th in the Bowl Championship Series standings and had a 6-3 record in the Big 12 this season, with wins against No. 14 Oklahoma, No. 18 Texas Christian and No. 24 Texas. Before this year, the Bears had an 18-102 record against conference opponents since joining the Big 12 in 1996. In the Bears’ final regular-season game, a 48-24 win over Texas, Griffin passed for 320 yards and two touchdowns while running for two more scores. The next time someone tells you that college football is run by a handful of schools that swap the trophies among themselves, tell him about Robert Griffin III winning the 2011 Heisman Trophy. 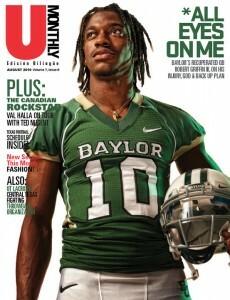 Griffin is a redshirt junior quarterback from Baylor, a double-wide among the traditional mansions in Corsoville. Baylor last won an outright conference championship in 1980 – RIP, Southwest Conference – and, until Griffin arrived, last had a winning season in 1994. Griffin took the Bears to a 7-6 record and a bowl game last season. This year, No. 12 Baylor is 9-3 with victories over three ranked teams. In his three-plus seasons, Griffin has set 52 school records in passing, rushing and total offense. He has thrown for 3,998 yards and 36 touchdowns this season, and is on pace (192.31) to set an NCAA single-season record in passing efficiency. And as of Saturday night, the university has its first winner of the most recognized trophy in American sports. Griffin is a model citizen, an outstanding student who talks of law school, an NFL prospect and a collector of outlandish socks. On Saturday, he wore Superman blue socks with the Man of Steel’s insignia and, of course, red capes. And as the voters indicated, he can play some ball. Griffin received 405 first-place votes among the 927 ballots. His point total (on a 3-2-1 basis) of 1,687 easily defeated redshirt junior quarterback and season-long Heisman favorite Andrew Luck of Stanford, who finished second with 1,407 points. Griffin appeared on 80 percent of the ballots; Luck, 75 percent. Alabama tailback Trent Richardson, who finished third with 978 points, appeared on 56 percent. Luck joins running backs Charlie Justice of North Carolina (1948-1949) and Darren McFadden of Arkansas (2006-2007) as the only players to finished second in consecutive seasons. However, when combined with Cardinal running back Toby Gerhart’s second-place finish in 2009, Stanford becomes the first school with three consecutive runner-up finishes. This entry was posted on Sunday, December 11th, 2011 at 6:55 am	and is filed under Sports. You can follow any responses to this entry through the RSS 2.0 feed. Both comments and pings are currently closed.